After spending two weeks in the Sahara desert, we needed a change of scenery. No more sand and merciless sun. Enter rain, a tiny Moroccan mountain town and thirty-odd very loud Moroccan kids. Come along for a short ride down anecdote lane from the time we volunteered as English teachers for Moroccan kids in Tioughza! In Morocco, there are just as many small, sleepy towns as there are tea pots in the market. They all look the same with their cookie-cutter houses and dusty streets. One of these towns is Tioughza, located in the South about one hour inland from Sidi Ifni. In Tioughza, just two blocks from the main street lives the lovely Moroccan family that we stayed with during our time in Tioughza. The family consists of mom, dad and their two very lively daughters. The 1-year-old is very much in her “no”-phase while her 2-year-old sister is more into watching her favourite show on Nickelodeon every afternoon. 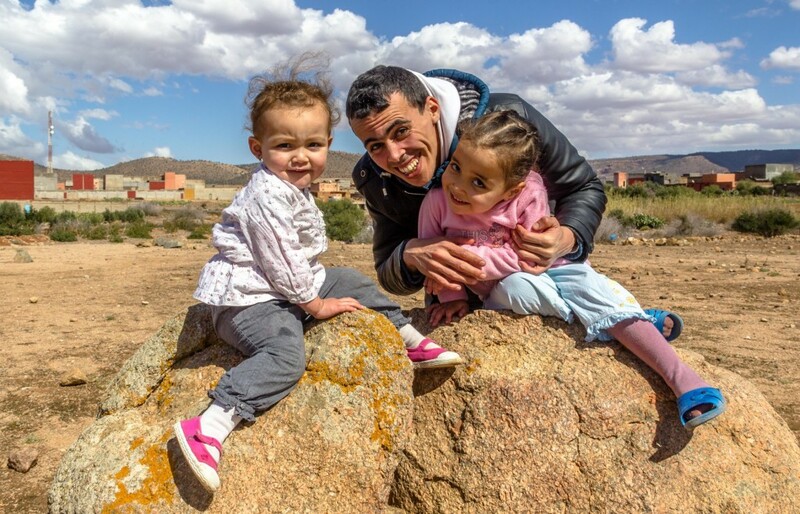 Abdella, the father, works as a teacher and is the driving force behind an after-school project by the name of Tilila, which in the local Berber dialect means “freedom”. Tilila is a unique opportunity for the local children to learn about different cultures and languages through all the volunteers that work on the project. To introduce ourselves to the kids, we agreed with Abdellah to make a short presentation about us and our respective countries (Denmark and Australia in case you were wondering). 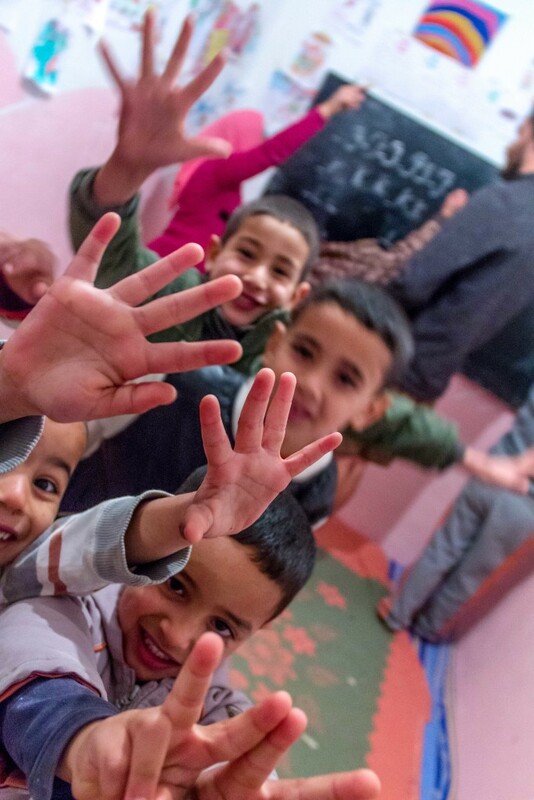 Well, if we were looking for an interesting cultural experience in Morocco, we sure got it in that classroom! As it turns out, the school children in Tioughza are by no means familiar with the good old “raise your hand and wait for your turn” system. So, there we were, a little bit overwhelmed by the situation and the unexpected noise level, but also enjoying the challenge of the cultural difference. Apart from the fact that at least one kid thought that Denmark was a part of Germany, which hurt my national pride a bit, the presentation went well. We managed to overcome the language barrier enough to tell a few stories about kangaroos and vikings. I can only imagine how strange these things must have appeared to the kids, living close to the Sahara desert. After the presentation, we divided the kids into two large groups and told them to paint banners for the classroom. Since the age range for the kids in Tilila spans from around 5 to early teens, some of the older boys decided it was more fun to paint the little girls’ clothes rather than the canvas. One thing is for sure, teaching at Tilila was never boring! We spent the next couple of days in a less hectic way, chatting in English with the kids in the classes and doing outdoor activities such as playing football and garbage collection. After a very interesting and fun week, we thanked Abdellah and his wonderful family for having us and went back on the road – convinced that teaching in Morocco for a living is a demanding job! The kids not paying any attention to Liam teaching…. I’m very happy to read your article and thank you for sharing it. I Hope you and your family are doing well, we think about our time at Tilila often.